If you want to run with the true powerhouses of the world, look no further than the Girl Scouts. Put down that box of Thin Mints and think about it. How many grocery stores will let you set up a rickety card table outside their doors and sell, cash only, cases of ground beef or sugar bomb cereal? That’s right, none. But say “no” to a crew of sash wearing, gaptoothed cookie-selling girls? Never. Especially when they’re chaperoned by…The Cookie Mother. The Cookie Mother is a highly coveted role, no matter how much your own mother might recount Troop 335 horror stories, circa 1972. This is a secret requirement of all Cookie Mothers — Never act like you really love this role. Competition is stiff and you’ll risk someone else’s suburban garage becoming the Regional Cookie Warehouse. Besides, the Brink’s driver would have to learn a new address. This morning at the bus stop, a week after our regular cookie orders were delivered, our resident Cookie Mother announced, “I’ve got 14 extra cases of cookies in my garage if anyone’s interested!” All the Bus Stop Mommies sucked in their coffee breath and avoided direct eye contact with the Cookie Mother. Do we admit we already ruined our diet and lied to our children by eating the last three boxes all by ourselves? That we delayed buying our kids new jeans last month to afford the Lemon Creams? One: None of us were going to weaken in front of the others. If we bought extra cookies, we’d do so in the dark of night, after we raided our kid’s piggy bank, waking the Cookie Mother by throwing rocks at her window. 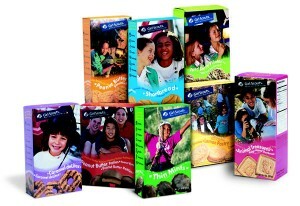 Two: The Girl Scouts are part of a well-calculated master evil plan designed to test the strength and character of housewives by delivering cookie orders halfway through Lent, when most of us have given up sweets. Maybe they’re also in cahoots with Weight Watchers! Three: Giving up sweets during Lent conveniently coincides with pre-spring break-beach-trip desperation diets. The Girl Scouts and their evil cookie regimes are out to sabotage us not just physically but also spiritually. No, I will be strong. I will persevere. I will… find a rock and set my alarm for 2 a.m.